352 pages | 6 B/W Illus. How do we find the right word for the job? Where does that word come from? Why do we spell it like that? And how do we know what it means? Words are all around us - we use them every day to communicate our joys, fears, hopes, opinions, wishes and demands - but we don't often think about them too deeply. 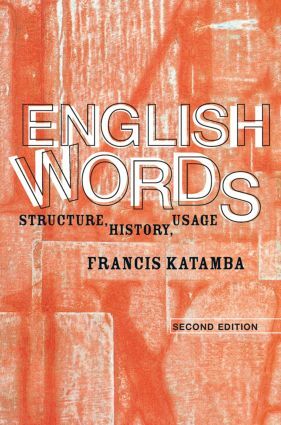 In this highly accessible introduction to English words, the reader will discover what the study of words can tell them about the extraordinary richness and complexity of our daily vocabulary and about the nature of language in general. Assuming no prior knowledge of linguistics, the book covers a wide range of topics, including the structure of words, the meaning of words, how their spelling relates to pronunciation, how new words are manufactured or imported from other languages, and how the meaning of words changes with the passage of time. It also investigates how the mind deals with words by highlighting the amazing intellectual feat performed routinely when the right word is retrieved from the mental dictionary. This revised and expanded second edition brings the study of words right up to date with coverage of text messaging and email and includes new material on psycholinguistics and word meaning. With lively examples from a range of sources - encompassing poetry, jokes, journalism, advertising and clichés - and including practical exercises and a fully comprehensive glossary, English Words is an entertaining introduction to the study of words and will be of interest to anyone who uses them.